They are the most powerful superheroes the world has ever known. But their internal problems threaten to destroy them worse than any villain ever could. Introducing The Vindicators! Published in 2006, this was the introduction to what was meant to be an ongoing series that, sadly, never took off (likely due to the financial problems which eventually shut down its publisher, Alias Comics). Written and created by Kevin Grevioux, this story takes place on a parallel Earth, which had an alternate history from ours. Basically, the history of Blacks and Whites is reversed. Whites were once enslaved in America by Blacks, and there was a Civil Rights Movement to give Whites more freedom. And today America is built with structures that resemble ancient Egypt. The Washington Monument has Egyptian hieroglyphics inscribed on it, & the White House is golden like a pyramid. There’s also a shot of a statue of Frederick Douglass in the place of the Lincoln Memorial. Just from the images on these opening 3 pages it’s a fascinating look at this other world. Then we cut to an alien world, deep in outer space, where Earth’s most powerful superhero, Darkstorm, has been summoned by an alien king, to help him and his people fight a ruthless alien warlord named Lord Xalis, who is trying to get some mystical galactic artifact, called the Rings of Apocalypse, which will make Xalis the most powerful being in the universe. Despite giving his all, Darkstorm falls before Xalis, who gainst the rings and seemingly kills Darkstorm. 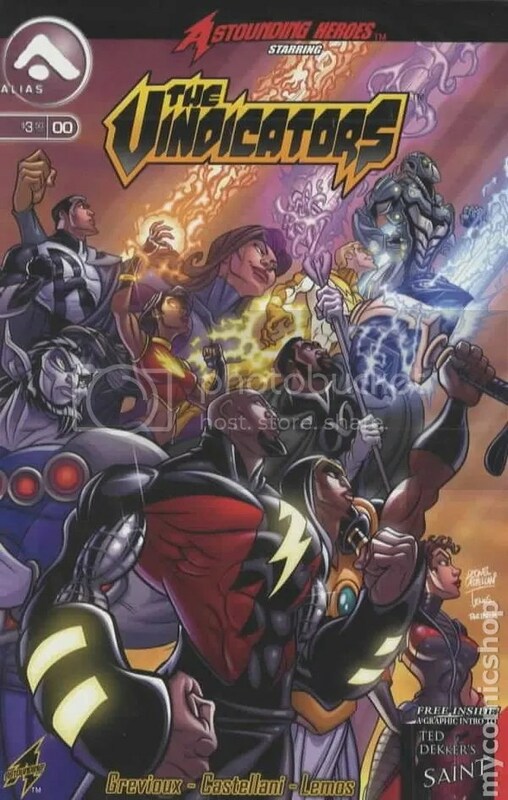 Back on Earth, two days later, the Vindicators are in the midst of a pitched battle with a team of supervillains called the Abraxans, whom the Vindicators have fought and defeated before, but this time the Abraxas are inexplicably more powerful than ever, and nothing the Vindicators can do seems to be able to stop them. Matters are complicated by the fact that the battle is taking place in the middle of a populated city, so the Vindicators are also trying to limit property damage and civilian casualties, while fighting the Abraxans, who have no such concerns. The issue ends just as the battle seems to be hopeless for our heroes, and I’m left wanting more. This 26-page story is chock-full of action, with a dozen new characters introduced at once, yet I never felt lost or confused while reading it. In fact, it was just the opposite, as I felt like I was thrust into a established longterm world of superheroes, and I was very eager to learn more. The Vindicators appear to be a team that could go toe to toe with the JLA or Avengers (they even have one token White member! ), and the villains are just as impressive, even if most of them fit traditional superhero archetypes. And major kudos goes to the artists, Leonel Castellani on pencils, and inker Javier Tartaglia do an AWESOME job in illustrating this issue, complimenting Grevioux’s script perfectly. This book is so good that even though it hasn’t been continued (I’ll still keep my fingers crossed that it might someday be possible), I don’t regret buying this one issue for a minute, and would still recommend that any fan of superheroes, alternate histories, and science fiction pick up a copy of this issue, just to read it. I give it 5 STARS.